The World Mission Society Church of God (WMSCOG) changes the whole world where found no love by spreading the love of God the Mother in this last age. Please come to the Church of God to receive the love of God the Mother and share the given love to others around you. One summer of 2005, after a missionary invited me and my wife, we I started attending the World Mission Society Church of God. At first it was very unique and surprising that it was hard to believe. But now I believe in Christ Ahnsahnghong and Heavenly Mother as God the creator. The Church of God change the members through the Bible. If you study, you will experience. My whole family is attending the World Mission Society Church of God. We got rid of our bad habits and became a happy family. Share the post "One summer, I received Christ Ahnsahnghong and Heavenly Mother♥WMSCOG"
When we realize the love and sacrifices of God, we can obey the teachings of God and become a child of God. The only reason we study the Bible is that we expect to posses the eternal life and to be saved. In the Bible, Elohim God testify to themselves as our savior and we’re the children of God. 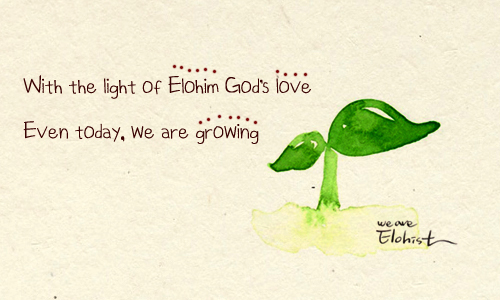 Praise and thanks to be Elohim God!